Viral Tibetan Wedding Photos Are Another Chinese Deception! 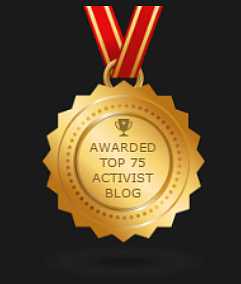 You matter to China’s regime, or we should fine tune that to say, your understanding matters. To such an extent that it invests considerable resources, time and effort towards ensuring you are cultured and influenced towards holding a perception that has been carefully fabricated to conceal the odious realities of Chinese rule in Tibet. While promoting the big lie that Tibetans are enjoying a freedom and modernity as ‘part of China’. An ideological war is ongoing, a relentless propaganda campaign engineered by China’s Ministry of Disinformation that’s directed at you and others within an international audience, to reassure and convince that reports of oppression, forced-sterilizations, torture, cultural genocide , forced-labor, and the denial of religious and civil freedoms suffered by Tibetans is untrue. The latest deception draws upon slick marketing strategy to push the message, with you as the ‘target customer’, the ‘product’ (the falsehood of a contended and progressive Tibetans) is being sold to you in a way long familiar to commercial agencies. The psychological levers that have been exerted upon consumers for years are now being used by China’s regime to sell you as fact what in reality is pure deception. How best to realize that? What medium would reach a maximum audience, while having a content to exert the outcome desired? Any ideas? Simplicity and emotion are key activators in marketing and some of the greatest commercials have used such a formula to great advantage, so with that in mind what concept has China’s propaganda engineers devised to shift your thinking on Tibet? Well we all enjoy a good story, right? What could be better than a happy ending for two young lovers? How many people have been cultured to celebrate and aspire to a marketed image of beauty? Have we been ‘educated’ to equate modernity with individual freedom and progression? Conceptual and emotive associations may already be coursing through your subconscious, triggering all sorts of programed feelings and ideas. A similar reaction from you being is sought by a series of images which appeared recently on the internet and have been aggressively promoted across a number of social networks. 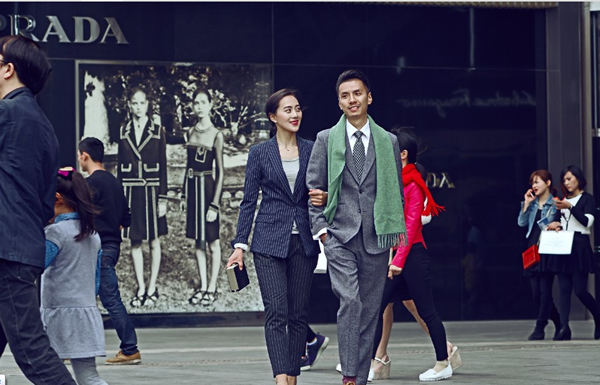 These show what is promoted as a young Tibetan couple in a variety of on-street locations in Tibet and China, these are though no ordinary images, it’s all very high-definition, cinematic poses, high fashion modernity and front-cover cosmetics. The message suggesting individual freedom, progression, social movement and development, masks a sly manipulation that exploits an emotional appeal associated with our response to the ideas of ‘love’ ‘courtship’ ‘marriage’ personified by and performed by these two carefully selected and highly photogenic models. 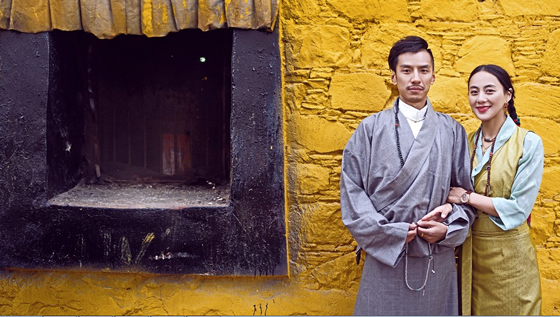 The photographs invite us to celebrate and be happy for these young romantics who one minute are dressed in Armani the next wearing traditional Tibetan clothes. 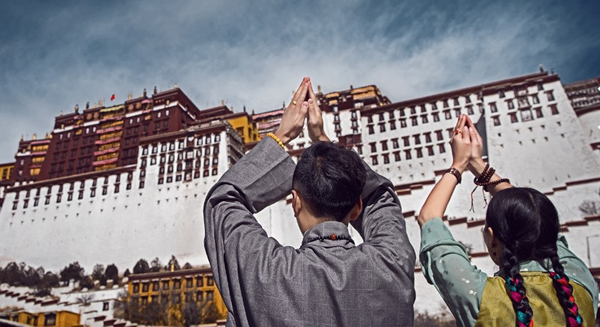 A modern Tibet in which cultural values are respected, so much so that we see them at the foot of Lhasa’s Potala Palace, hands raised in veneration, but of what exactly? Eagle-eyed subscribers may notice at the top of that former home of the Dalai Lama flies the flag of communist China and we suspect that it is to China’s regime that these actors offer their praise. The reality is of course very different indeed, although the facts of China’s tyranny against Tibetans has not dissuaded media organizations such as CNN from promoting this deception, without criticism or question. Either that agency is utterly inept in terms of journalism or it is a willing partner in peddling China’s disinformation on Tibet. Whatever the case by publishing these images it is misinforming its readers and viewers about the plight of ordinary Tibetans, whose culture and freedoms are violently suppressed. We hope our readers and subscribers will share this article and in so doing spread the word to counter such offensive and duplicitous propaganda.